Aromatherapy has a very wide scope description to it that doesn't necessarily cover what essential oils are capable of, in its name alone. It is not all about pretty aromas there are so many health and wellness benefits too. Essential oils are able to work in many different ways to help the body and can be applied to skin, ingested (with professional advice only) and inhaled through the nose. Did you know your lungs are connected directly to your bloodstream? Your nose has two functions; to filter and warm the air that you breathe in, as well as to act as the first part of the olfactory system (your sense of smell). The lungs have a HUGE surface area that is intimately connected to your blood system, so when directly inhaling essential oils there is a straight path into your blood stream. Essential oils great at treating bronchial issues such as a cough or chest infections for this reason. Olfaction is one of the most primal senses in the human brain. 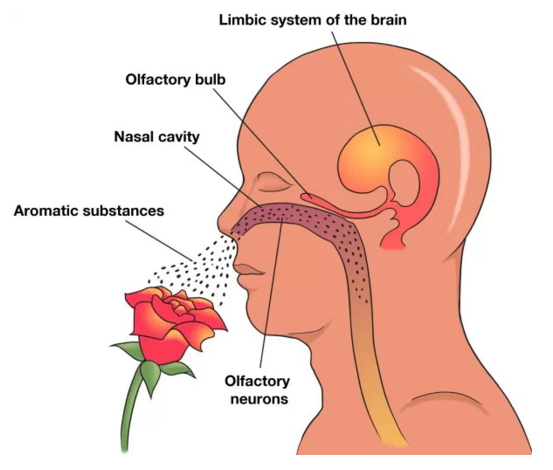 Smell is a chemical reaction that happens when receptors in your brain interact with the chemicals that make up what you just smelled. As early as 1923, it was noted that odours produced an immediate effect on respiration, pulse, and blood pressure. Odour has a huge effect on the central nervous system. Smells have instant psychological and physiological effects. Smells can even control who you are attracted to and who you would like to stay far away from you. Essential oils also work in this same way. It's widely known by realtors that the smell of vanilla can give a potential buyer the feeling of home, and even possibly help them in their decision to pick that house. Lavender has a long reputation for helping calm and relax the mind for a better night's sleep, and in studies has even shown to be effective in helping ADHD patients focus better. Even peppermint has long been used to help with nausea and digestive issues.